<?xml:namespace prefix = o ns = "urn:schemas-microsoft-com:office:office" /> It is that time of the year when the jumpers come off and we start to notice those additional curves and love handles that have grown comfortably secure under our layers of clothes. So what do we do about it? Well, forget Atkins, forget surgery and lets think �lifestyle change�. And what better way to make that change than to take a walk on Estepona�s paseo maritimo (promenade) and end up having a deliciously healthy meal and fresh juice or smoothy at Elemi�s restaurant? Elemi Restaurant is a refreshing change and exciting addition to the range of culinary delights offered by restaurants in the Estepona region. It is 100% vegetarian but don�t let that put you meat eaters off, (and that�s coming from one!). The food is fresh and everything is homemade. There is a huge variety of juices and smoothies (made with organic, fat free, frozen yoghurt). The choices are endless and include thirst quenching and healthy concoctions such as the �Age Defier� (mixed berries, banana and apple juice) to immune booster (carrot, apple, orange and ginger) � perfect for a hot Summer�s day and filled with lots of vitamins. The cuisine offered has something for everyone from international wraps � ranging from Lebanese to Italian, toasted paninis and scrumptious salads. There is also a children�s menu � fantastic to ensure that kids eat healthily. Not to mention the dessert menu�.. Check out the day time menu for yourself. Apart from the exquisite food, the setting is extremely pleasant and there is a peaceful and relaxing feel to the restaurant inside. For those wanting to dine al fresco, there is also an outdoor patio area. 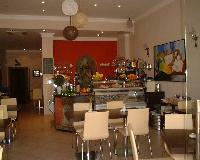 Why not have lunch at Elemi�s and follow it with a stroll along the paseo maritimo to the children�s park. Alternatively why not take the children roller blading or cycling and finish off the day with a meal at Elemi�s? Parking � I would recommend parking at Carrefour (lots of spaces, free parking and hassle free). It also gives you a chance to walk right down to Estepona Port and back again after a well- deserved lunch!